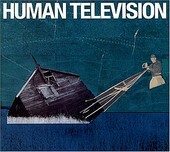 On the Human Television EP the band delivers standard, loose indie-rock fare. Nothing too compelling, nothing to exciting, but nothing really bad either. The songs can be jangle-y ("Saw You Walking By"), containing a memorable bounce that makes you want to sing along. Or they can drone on, bogging down their otherwise jangle-y efforts ("I Forgot" and "Year Right"). Some may call it stoner-indie-rock, while others may just choose to ignore it. It's got its moments, but too much of those moments are buried in its stoner tendencies. I'll give it a C-.